Our team of service technicians and engineering professionals have over 250 years of HVAC experience. When you combine our knowledge and skill with the top names in HVAC equipment, like York, Carrier, Trane, McQuay, etc. and you get a top-of-the-line system that will meet all your needs. Our equipment is in great shape, and ready to go. So, let us know what you need! From installation to regular maintenance, we’ve got you covered! Speak with one of our certified professionals today! 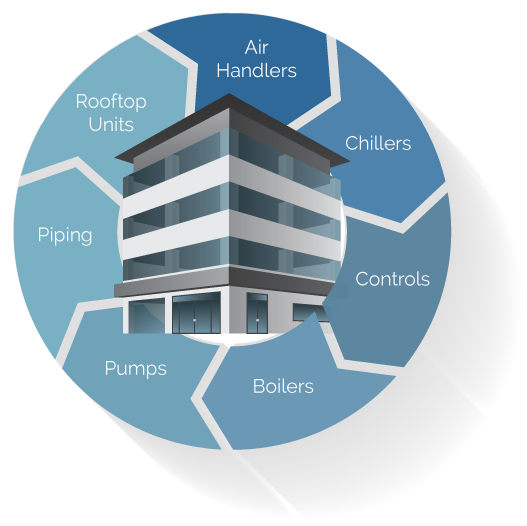 The space above your facility can be successfully utilized in housing your HVAC system when you choose to have rooftop units installed. AHUs are designed to circulate the air in your facility, bringing you a consistent level of comfort in all occupied areas. Keeps the entire HVAC system cool by removing excess heat, maintaining safe operation and increasing efficiency. Maintain fluids, pressures, and temperatures throughout your HVAC system for optimum performance. Allow you to make needed adjustments to your HVAC system to achieve optimum comfort in your facility, whether you’re on site or remotely. Deliver chilled, hot, and condenser water to your HVAC system components to keep things running at just the right temperature. Provide efficient, even heating for even the largest facilities, all at a low cost to maintain and service. All of our chillers and boilers are mounted to flatbed trailers, making delivery and pickup of the units simple and quick. With a wide capacity range available, we’ll be able to get you up and going in no time. From design, to installation, to regular maintenance and service, AMS can meet your HVAC needs every step of the way. Our innovative engineering brings you the best in convenience and efficiency, so you can take comfort, convenience, and reliability in your facility to a whole new level. Our team of service technicians and engineering professionals have over 250 years of HVAC experience. When you combine our knowledge and skill with the top names in HVAC equipment, like York, Airstack, and Trane, you get a top-of-the-line system that will meet all your needs.